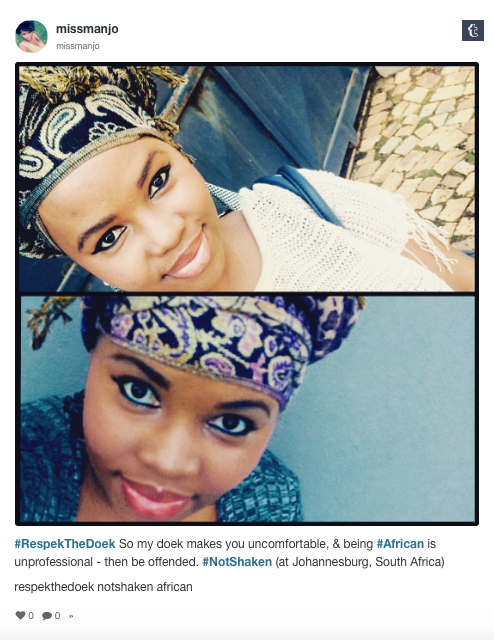 Social media users, have you come across the #RespekTheDoek campaign yet? 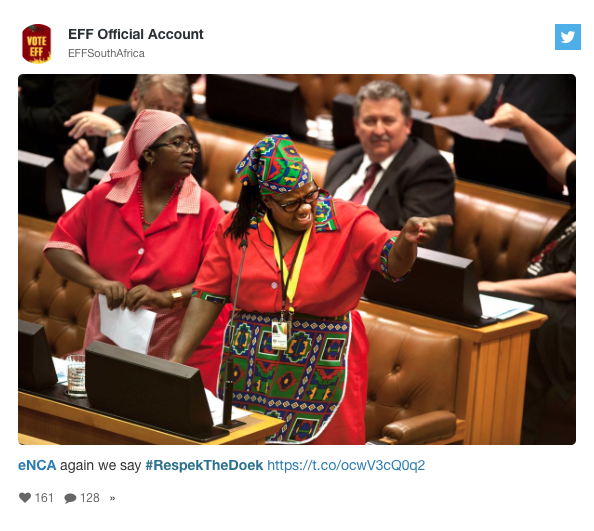 It began ten days ago on Twitter, when the South African network eNCA removed a video package from its TV channel on the grounds that reporter Nontobeko Sibisi shot it wearing a headwrap – or doek, as it is called in Afrikaans. eNCA’s policy, which claims to “be in line with [South Africa’s] corporate and national values”, deems headgear inappropriate. Effectively, eNCA is saying wearing a doek, which is a famous popular wear for African women, religious and otherwise, is not aesthetically befitting of television journalism. Thus, African women who choose to have the doek, must then feel incomplete or inferior for their aesthetic choices. 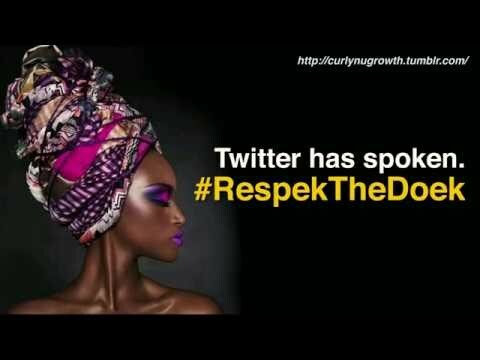 The viral phenomenon has quickly evolved into a global counter-cultural initiative against oppressive media attitudes toward black women, involving fashion magazines and platforms. This is yet another campaign that puts the adorned black body on the front line of the fight for equality and dignity across the diaspora, reminding us that everyday choices, including tying a cloth around our head, are by default political. Today, these implicit political acts are also visual acts, producing a new imaginary where likes and shares, selfies and Snapchat’s more recent update, influence the way battles are fought and won. Images are not collateral to these battles: their virality, the potential to circulate and reach out, is by far the most sought after currency of the contemporary political debate. 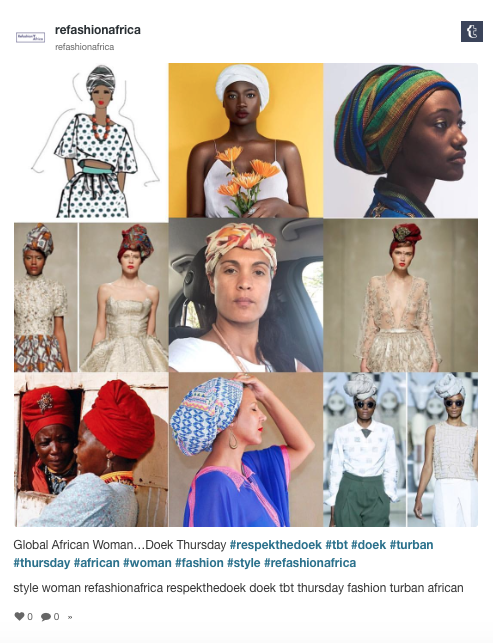 #RespekTheDoek is happening only weeks away from the day Lupita Nyong’o appeared in a sculptured hairstyle at the Metropolitan Museum of Art’s Costume Gala 2016 that referenced “the hairdos from all around the continent”. Pictures of the actress were retwitted and shared thousands of times by users who clapped back at Vogue for saying the coiffure was a tribute to Audrey Hepburn. 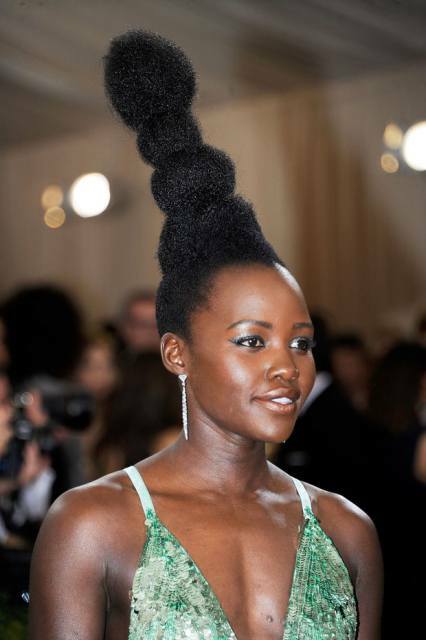 On that occasion, as now, headdressing was used to assess the professional worth of a black woman and map her professional genealogy: was Lupita calling back to Africa or Hollywood? The culturally-conscious video she put on Instagram clarifying that her inspiration had indeed been the continent, shows the extent to which beauty choices and presentation drive not only black subjectivation, but black political subjectivation as well and cannot be dismissed as vapid and inconsequential forms of ‘armchair activism’. This issue is especially relevant when we considering head-dressing. In every culture, headgear and hairstyles direct attention to the body as a cultural entity with layers of association and meaning. In Africa, headgears “can denote membership in certain religious and initiation societies, mark and celebrate changes in a person’s life cycle, identify key participants at rituals and festivals [as well as] satisfy the community’s notion of decorum and modesty and to function as a statement of ethnic affiliation in a multiethnic environment”(Arnoldi and Muller Kreamer 1995: 24). They are an acknowledgment of class hierarchy, as well as of gender relations and marital status. In contemporary Nigeria, the gele, the starched and elaborate Yoruba headtie, conveys social standing and marital status, with single women wearing their ends facing up. 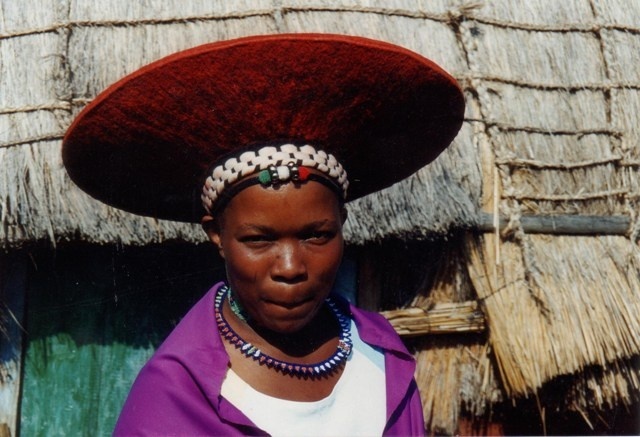 The headband placed above the forehead of the isicholo, the red hat worn by married Zulu women is a sign of respect for the adult men in her husband’s family. Among the xhosa of South Africa, the iqhiya has been worn by married women also out of respect for their in-laws, but also as part of the uniform of domestic workers: a visible symbol of their inferior social standing. Similarly, in America, the headwrap is a statement of black resilience to white and colonial annihilation and, as such, it has been embraced to express empowerment. Carol Tulloch writes that the headtie was part of a system to control the body that the slaves both embraced and were forced to embrace. It also was a reminder that they were ‘lesser’ human beings. [T]he headtie symbolized the tie between the slave and the production of cotton on the plantation. It was a metaphor for the inextricable tie between the plantation owner and the slave-owner. Furthermore it was an allegory for the volatile and transient tie between master and slave. These relationships were not exclusive to America. Slaves in Jamaica also endured the same form of controlled tie. Within these historical contexts, the headtie acted as presage (Tulloch in Owusu 2000:228). Tulloch also brings attention to the role of the headtie in the evolution of black diasporic identity. The headtie symbolized the tie between African Jamaican women and Indian women as ‘Other’, despite the vast cultural and linguistic gulf that divided them. In the headtie, there had developed a relationship ‘between masses, areas, forms, lines and colours.’ In its longevity the headtie acquired an aura of simplicity that embodied a community relationship based on history, historical roots, colonialism and difference (Ibid. : 229). 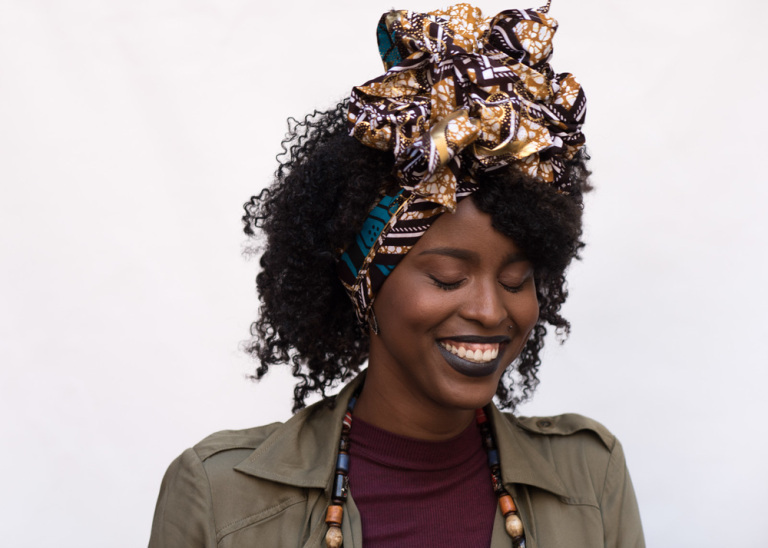 The headwrap holds these memories in its folds and perpetuates them, at the same time claiming the black woman’s right to adorn herself and uphold cultural traditions. There is no straightforward meaning, or symbolism attached to this ornament, which seems rather to inspire ever new ways of expressing black identity. In an article for Blue Stockings Magazine, Patricia Ekpo argues that the headscarf is one of the elements of a collective embodied performance of carefreeness, by which black women are elaborating new ways of seeing themselves. When a black woman labels an image of herself or another black woman as #carefree it is not merely a comment on an image that could be described as looking cheerful, but a radical act of owning the state of being and becoming free. She is enacting, reenacting, and embodying an affective state that was never supposed to be hers (Ekpo, 2015). 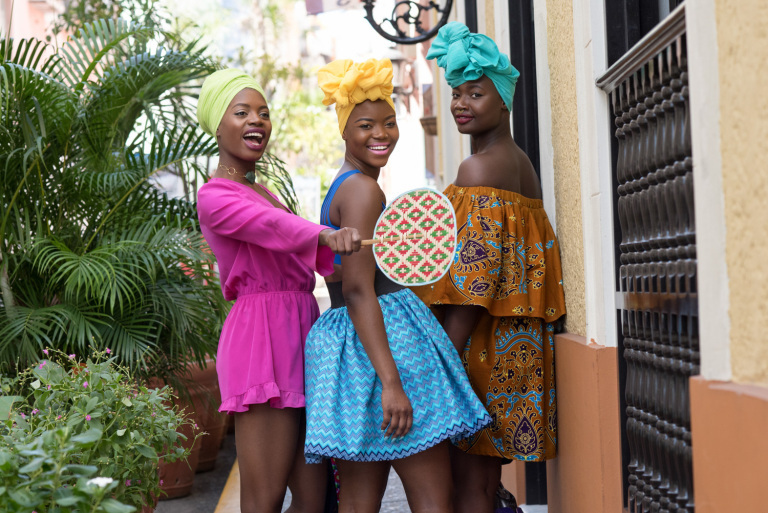 Follow the online trend for Famn Djanm, an e-shop selling headwraps run by Paola Mathe, an Haitian businesswoman from New York, to see how this ethic of personal freedom can be economically and culturally empowering. 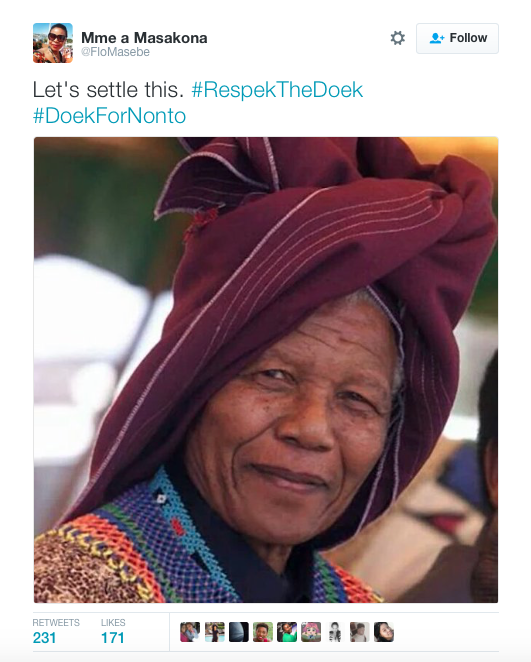 #RespekTheDoek is the last chapter of the evolving and multi-faceted movement of black assertion that uses fashion, beauty, and ornamentation as strategic weapons of self-making. We should then perhaps talk not of the doek/headwrap/headtie/turban, but of headtying, headwrapping, turbaning, doeking as the practices that make black subjectivation visible and meaningful to the global community, whatever their uses. Arnoldi, M.J. and Muller Kreamer, C. 1995. Crowning Achievements: African Arts of Dressing the Head. African Arts 28.1. Tulloch, C. 2000. 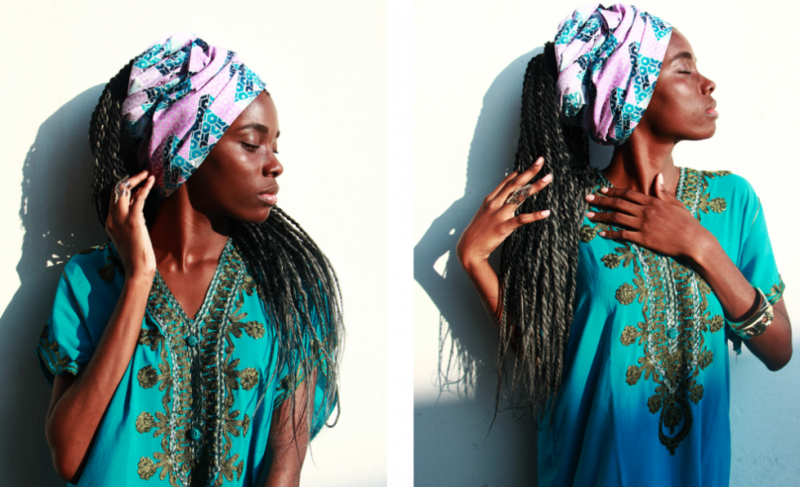 That little magic touch: the headtie and issues around Black British women’s identity. In Black British Culture and Society: A Text Reader. ed. Owusu. Routledge, London.